Pretoria — Zimbabwe is now open for investment in all sectors and the new administration led by President Emmerson Mnangagwa is doing everything possible to create a conducive environment for investors by amending various pieces of legislation. Addressing a highly-subscribed business meeting on his maiden foreign assignment here yesterday, President Mnangagwa said it was no longer business as usual in Zimbabwe. He appealed to Zimbabweans in the Diaspora to return home and exploit business opportunities presented by the new dispensation. "Zimbabwe is open for business. Yes, there will be political issues, but primarily it's economics and trade for Zimbabwe. To achieve that, we need to revisit our own legislation in Zimbabwe to open for business," he said. "With my team, we first began to look at the indigenisation legislation. We are in the process of amending and updating that legislation, but we allowed the Minister of Finance (Patrick Chinamasa) to announce a major shift to that policy with regards to extractive industry in Zimbabwe. In the past, the policy was that investors coming to Zimbabwe were required to agree to 51 percent for Zimbabwe and 49 percent for the investor," he said. "We have now changed to limit that application to two minerals only which we believe for now we do not have adequate technology or knowhow to access the quantum of those minerals, that is platinum and diamonds. We have reserved those two minerals so that question of 51/49 applies to those but for the rest of other 19 minerals in Zimbabwe is totally open." President Mnangagwa said there was still a reserved sector for locals comprising businesses that do not require special skills. He said they had given discretion for special circumstances in cases that could require a Government waiver. President Mnangagwa outlined several businesses opportunities presented by the new dispensation. He said Government had already awarded a US$400 million contract for the refurbishment of the National Railway of Zimbabwe to Zimbabweans in the Diaspora but the area had other vast opportunities. "In the area of railway, we need to refurbish, modernise the current network in the country. Secondly, we need to introduce a new network of railways in Zimbabwe and thirdly we need to construct the railways because both Maputo and Beira are now congested. Durban is also congested," the President said. "We now have on the cards the construction of another line from Zimbabwe to north of Beira and its open again for bidding. This is with regards to railway," said President Mnangagwa. "The comrade who was here who mentioned that we have taken up the dualisation of the South-North highway, that is Beitbridge to Harare-to-Chirundu, the first part has been taken, that is Beitbridge to Harare. We still are open for people to come for the ring road around Harare and the dualisation of the road from Harare to Chirundu and also second phase of road dualisation from Mutare on the east to Plumtree in the west, the third one Beitbridge via Bulawayo to Victoria Falls. All those are open for investment. This is why I say Zimbabwe is open for business and for those who want to make money," he said. President Mnangagwa continued: "May I say that I am hopeful, my team is hopeful. There is no business as usual. Things have changed. It is a new era. I am from the military. If it is left turn it's left turn, if it is right turn, right turn. My ministers are very clear about that stance. I believe that together we can move forward. I am aware of the abundant skills that rest here among you Cdes from Zimbabwe. I appeal to you to come to Zimbabwe. Whenever you come, look for the opportunities that now present themselves. "We are almost 16 to 18 years behind others. We do not need to reinvent the wheel. We need to catch up and overtake them and to do that we the politicians must create an environment where you can survive. To do so and to achieve that there must be continuous dialogue between those in Government and those in the private sector, telling us your challenges that you want us to correct and us, of course, telling you our challenges that we want you to correct. That way we can move our country." 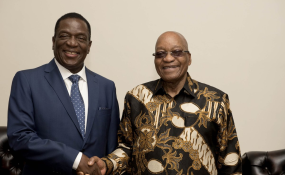 President Mnangagwa, who flew to South Africa yesterday morning, returned home last night. He was accompanied by his Special advisor Cde Chris Mutsvangwa, Foreign Affairs and International Trade Minister Dr Lieutenant General Dr Sibusiso Moyo, Transport and Infrastructural Development Minister Jorum Gumbo, Finance and Economic Development Minister Patrick Chinamasa and Industry and Enterprise Development Dr Mike Bimha. Minister of Climate and Water, who also happens to be the Zanu-PF chairwoman Cde Oppah Muchinguri-Kashiri, was the Acting President.